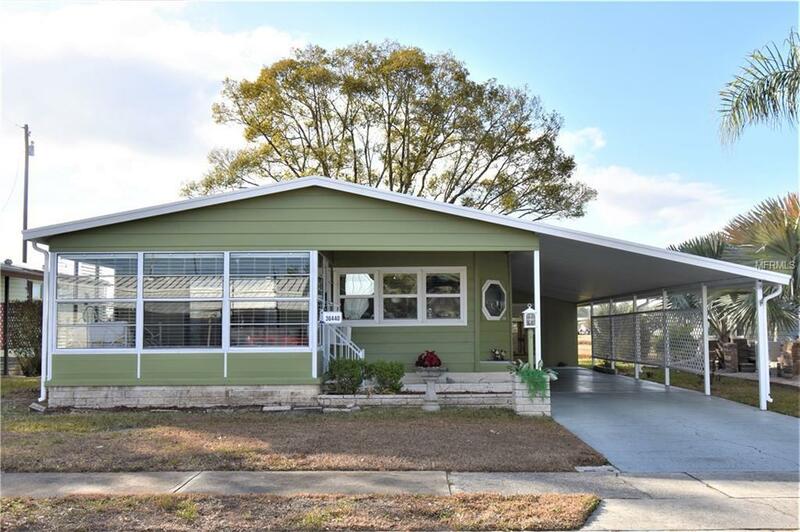 "PRICE REDUCED" This 2 Bedroom, 2 Bath home in OAKS ROYAL is GORGEOUS! The first thing you will notice is the curb appeal and oversized carport as you drive up...then inside the seller has made numerous updates! The Kitchen and Dining Room are here - the kitchen has lots of cabinets and counter space and a Dinette too! The Dining Room has a built in china cabinet with lots of storage and a skylight. The 20x13 Living Room is so spacious; there's plenty of room to entertain. The Florida Room is at the front of the home and is 13x10. The Master has an extra large closet and a private bath with an upgraded vanity and cabinets, shower & laundry facilities. Seller has perfectly maintained the home by having the AC serviced every year and having pest control services annually. They have even installed new windows! Great for energy efficiency. They have also added a water softener, new flooring in the master bath and kitchen, toilets, blinds, and faucets. The outside of the home has been painted too. It's PERFECT! Come see it today!